Say you’re about to watch a YouTube video in a browser window. Unless you go full-screen, your screensaver could pop on or your display could go to sleep when you don’t want it to. The same thing could happen when you’re reading a book in iBooks, or showing colleagues a presentation with Keynote. But having to open System Preferences to fix that can be a pain, especially since they’re in more than one place. The screen saver preferences are in Desktop & Screen Saver, while the display sleep preferences are in Energy Saver, which has separate tabs for battery and power adapter. Plus, the scenarios where you want to keep your Mac awake are usually pretty temporary. So not only do you have to remember to tell your Mac not to go to sleep, you also have to remember to go put those settings back the way they were when you’re done. Lungo fixes all of that. Lungo does one thing extremely well: It keeps your Mac awake when you need to, and the rest of the time, it stays out of the way. It’s set up to keeps your Mac awake for a period of time, and it’s easily accessible in your menubar anytime. System Preferences never has to get involved. Install Lungo via the Setapp application. It shows up in your menubar as a little mug of espresso. 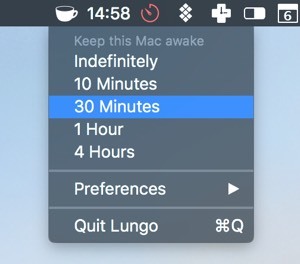 Click it for the menu, where you can choose if Lungo will keep your Mac awake indefinitely, for 10 minutes, 30 minutes, 1 hour, or 4 hours. Or just right-click the icon to enable or disable Lungo. That’s it! When Lungo is enabled, your Mac stays awake. When it’s disabled, the screen saver and sleep behavior are ruled by whatever you have set in System Preferences. This lets you keep your Energy Saver slider set low, which saves laptop users plenty of battery life. Set your display to sleep after 10 minutes, or even less, because you know it’ll be easy to keep your Mac awake when the situation requires it with just a click of the menubar. While it’s simple, Lungo has some nice touches. It supports macOS’s dark mode, which keeps your menubar dark. (That option is in System Preferences > General.) And Lungo’s own preferences let you customize whether the menu appears with a left-click or a right-click. Lungo can be especially handy when you’re using other apps in Setapp. Take your time brainstorming in iThoughtsX or create a mindmap in XMind. Keep your Mac awake while you’re recording a guitar part into n-Track Studio, a multi-track audio recorder. Bring your laptop to a team meeting so everyone can discuss the project in Pagico or Merlin Project Express. Video chat the hours away with ChatMate for WhatsApp. Watch YouTube or other videos in a window with Elmedia Player. Read a long email in Canary Mail or Unibox. Keep your screen awake while CleanMyMac X is doing its thing, or Gemini is scanning a huge hard drive for duplicates. 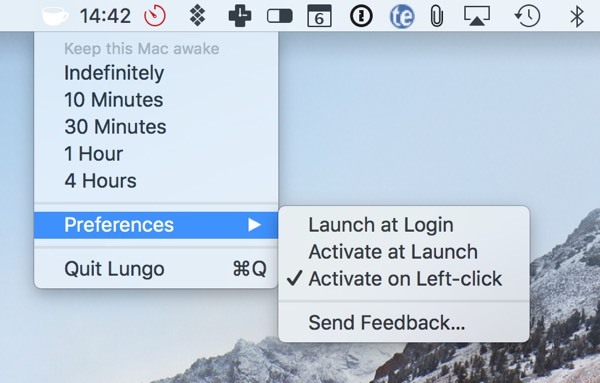 Once you use Lungo a couple of times, you’ll appreciate the convenience of being able to give your Mac a jolt of wakefulness. Lungo is a handy addition to the Setapp family.